With increasing population around the globe, the demand for energy too has gone up. The rate of energy consumption is projected to double by 2050 where there will be more than two billion vehicles on the road, accounting for 70 per cent of the total energy consumption. 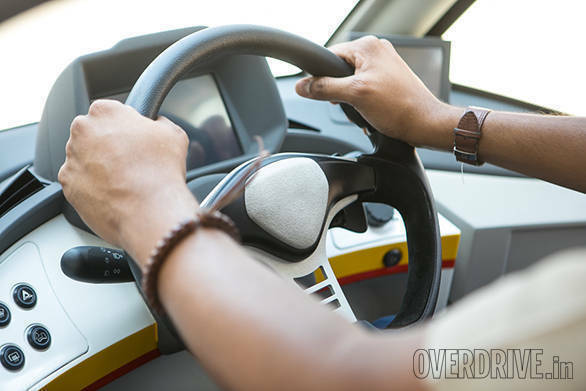 In addition to the existing issues of traffic congestion, large-scale damage will be caused on the environment due to the large carbon footprint left by these vehicles. It is believed that the transport sector accounts to 25 per cent of CO2 emissions in the world. To tackle this, the emission norms are being made stricter with an increasing focus on higher fuel efficiency. But we don't have to wait for the technology to evolve further to address this problem. Instead, it can be dealt with right away using existing options, claims Shell. Developed as Project M, the Shell concept car is claimed to be the most ideal urban mobility option. "How can a car that small make a big impact on the environment?" was my first thought when I saw the images of the Shell concept car. 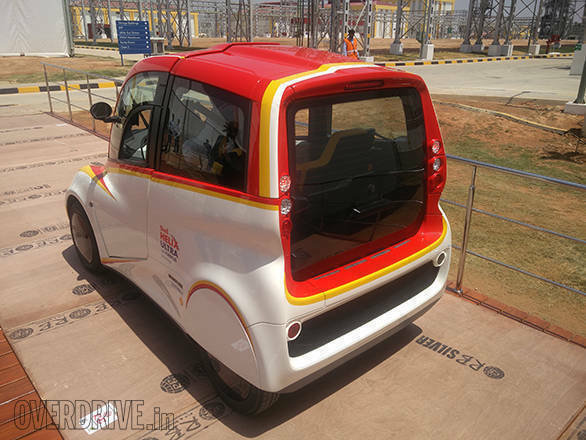 We were invited to Shell's new facility in Bangalore, the company's third technology development centre in the world. 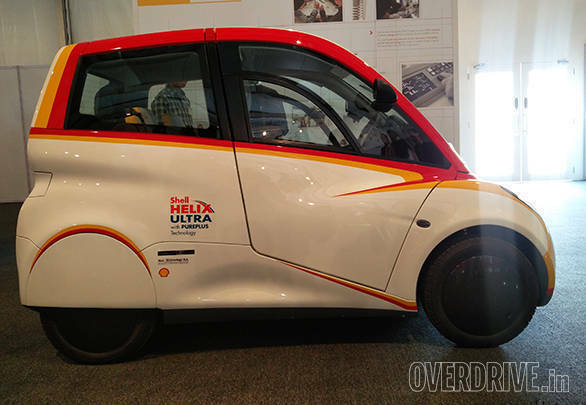 This concept car has been jointly developed by Shell, Gordon Murray design and Geo Technology. 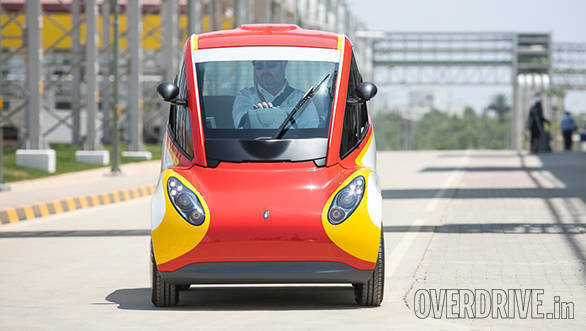 The Shell concept car is based on the Gordon Murray's T.25 city car which debuted in 2010. Kevin Doyle, development manager, Gordon Murray Designs, mentioned that the design brief that was given to them had the prime objective of making the most efficient car. It is really interesting to see how the design engineers squeezed in all that tech in such a compact car and that was a big challenge for the design firm, said Kevin. The concept car, for instance, has a coefficient of drag of 0.29, identical to that of the BMW i3. This is remarkable considering the car has a tall boy design. The concept car measures 2,500mm in length, 1,350mm in width and 1,600mm in height and that makes it 599mm shorter, 145mm narrower and 52mm lower than the Tata Nano. The concept car, in fact, is so compact that it can be parked in an area with the size of a table tennis table. While the overall design of the car is unique, the highlight has to be the canopy which tilts forward so you can get in. More than aesthetics, the canopy has been designed to ease ingress and egress without taking any space to open the door, making it possible to park it almost anywhere, including the tightest of parking spots. The cabin layout is identical to the T.25 car. 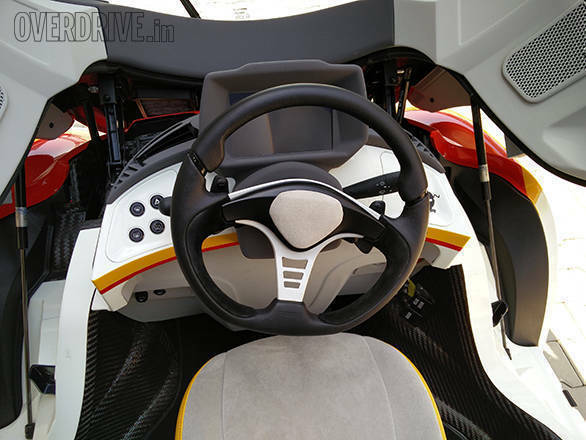 The centrally positioned driving seat and flanked by two passenger seats on either side is akin to the layout in the iconic McLaren F1 road car. In addition, it saves the hassles of manufacturing different cars for left-hand drive and right-hand drive markets, thereby reducing costs. It is a concept and hence features the essentials of a car cabin such as an air conditioner and other bits. However, it does come equipped with seat belts for all the three occupants. The company also states that the structure of the concept car can resist front and rear impact and also features anti-side intrusion system. It also complies with the Euro NCAP passenger and pedestrian impact regulations. Gordon Murray design has made extensive use of recycled carbon fibre in the construction of the structure of the car, so it tips the scales at 550kg only. Another advantage is the reduction in manufacturing energy consumption by 45 per cent. Most importantly, the concept car is built on the iStream chassis, similar to what underpins the Yamaha Sport Riding concept shown at the 2015 Tokyo Motor Show as well as the upcoming TVR sportscar. The iStream chassis is more economical with 80 per cent lower capital investment and has a substantial 60 per cent lower energy consumption during manufacturing. This is in addition to improved rigidity, corrosion resistance and durability. 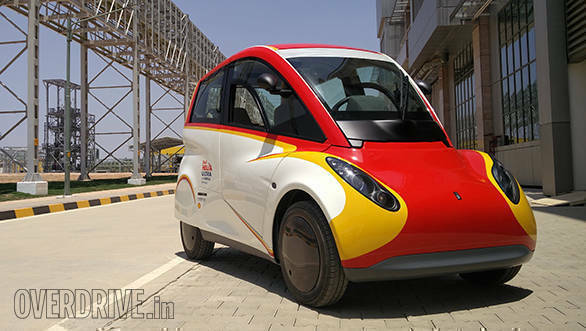 The company claims that building and driving the concept car for more than 1 lakh km will still consume considerably less energy than manufacturing an SUV and simply keeping it in the showrooms in the UK. The Shell concept car is powered by a 3-cylinder 660cc motor by Mitsubishi that also does duty on the latter's i-Car. This motor makes 43PS/64Nm and is mated to a 5-speed AMT unit borrowed from the Smart hatchback. Kevin stated that they've employed a unique solution to help improve engine cooling. The radiator has been positioned in front of the rear-mounted engine, and the under body has been designed in such a way that the air flows to a duct that then guides the air into the radiator. This motor has been modified by Geo Technologies, founded by Honda F1 engine designer Osamu Goto. Geo Technologies has also redesigned the internal components to make them lighter and also offer less friction. The valve train components feature a diamond-like carbon (DLC) coat that minimises resistance and reduce wear. Additionally, Shell has developed bespoke 0W12 engine oil for this car, based on the Helix Ultra. This is the thinnest oil in the world where the base oil is developed from natural gas but not crude oil, thereby emitting less sulphur, particulates and nitrogen oxides. The low viscosity ensures that the oil is less resistant to extreme temperatures and will deliver optimum efficiency. Shell claims that the oil contributes to five per cent improvement in its fuel efficiency. Since this was a concept car, we were given only 10 minutes of driving experience. Getting inside the cabin was easy for me while Kevin had to squeeze himself into the bolt-on rear seat. As soon as the motor is brought to life, it makes the typical clatter of the smaller displacement 3-cylinder motor. We were told not to cross a speed of 30kmph as it was inside the company premises. 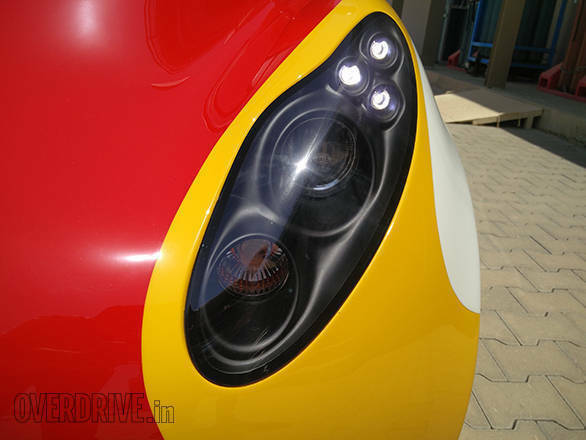 However, Kevin told us that in his hands, the Project M car touched a maximum speed 156kmph. 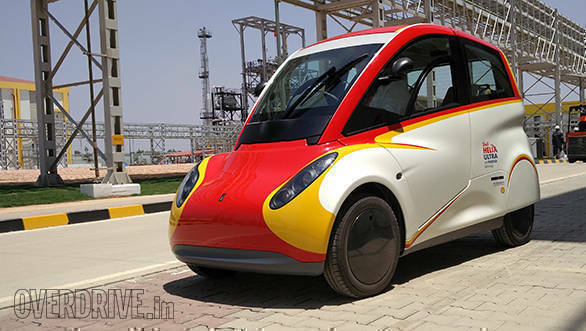 It has a claimed 0 to 100kmph acceleration of 15.8s, and Shell says that the concept car can cover 100km in just 2.6 litres of petrol if driven at a steady speed of 70kmph. Its compact lightweight construction makes it easy to manoeuvre too, but the steering wheel feels heavier since it is not power assisted. 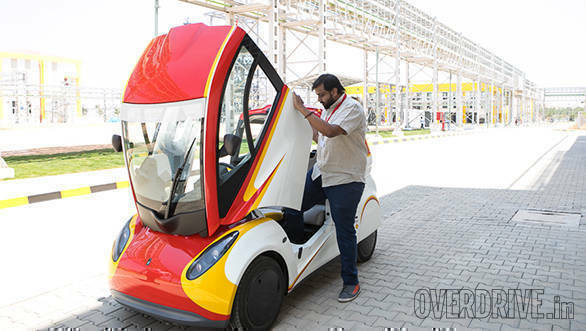 Shell claims that the concept car produces 28 per cent and 32 per cent less CO2 than a petrol-powered city car and a hybrid car respectively. Perhaps, never. The Shell concept car is a case study that was never made with an intention to go into commercial production, states Andrew Hepher, vice president, Global Commercial Technology, Shell. It will be a test bed for the development of next-gen lubricants, new engine design as well as new manufacturing techniques. The primary aim of the car was to address the needs of urban mobility of the future and at the same time be relevant in the current scenario. However, Andrew adds that some car manufacturers have shown interest in the concept car.